The extreme case with = 0 (no light filter at all) is also included, as discussed in a special section later. That is, just subtract a heavily filtered value from the current value. This is intuitively appealing: roughly speaking, the lightly filtered value approximates a recent value, and the heavily filtered value approximates an older value. Derivatives are the difference between a recent value and an old value, after dividing by a scale factor representing a time interval. The original “MACD” acronym stands for “Moving Average Convergence Divergence”. This terminology describes a particular calculation used for trend analysis for investments. In that case, the heart of the calculation involves exponential filters with 12-week and 26-week time constants. That specific MACD calculation also throws in another 9-week exponential filter in series, to filter the derivative estimate even more, and also enable estimation of the second derivative. Here, we use the terminology “MACD approach” to mean the idea of taking the difference of two filter outputs to estimate a derivative. This “moving average” part of the MACD acronym abuses the ARMA “moving average” terminology, since there is no input history that is used - just the current input. This naming continued the unfortunate practice (used in stock analysis and some other places) of calling an exponential filter an “exponentially weighted moving average” (EWMA or EMA), even though it is not a moving average using traditional time series terminology. 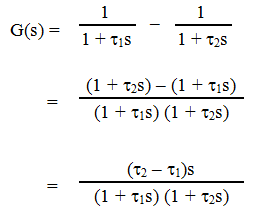 This approach with two exponential filters generates an estimate of the filtered value of the derivative. The calculation is the equivalent of those same two filters in series, in series with a differentiator, with an overall gain of the difference in the two time constants ( - ). That is, to estimate the derivative, take the output and divide it by ( - ). When using exponential filters with a fixed sample time interval, the time scale is based on the sample time. To convert to the time derivative, divide the output by the sampling interval time. One important special case is when = 0. That is, you take a variable with no filtering, and subtract a filtered value using a filter with time constant . In this case, you get an estimate of the derivative filtered by a filter with time constant , and gain . The full version with both filters is usually preferred to reduce the impact of noise. As an approximation at low frequencies, the MACD approach can be seen to roughly approximate a differentiator in series with a single filter. The approximate filter time constant for that single equivalent filter is roughly the sum of the two time constants ( + ). The output has the same gain, equal to ( - ). Why does MACD estimate the time derivative? That is, we have a first-order filter (lag) in series with a differentiator with a gain. The first order filter has a time constant equivalent to the sum of the original time constants. The gain term for the overall block is the difference of the time constants. The full MACD calculation involves 3 exponential filters. The derivative estimate described above, when plotted on a graph, is called the “MACD line”. An additional filter called the “signal filter” then further filters the MACD output (with a 9-week time constant for the typical MACD calculation). The output of that signal filter is called the “signal”. A subtraction (MACD - signal) is called the “histogram”, not because it is an actual histogram in normal probability usage, but probably because it is usually plotted with bars. The “histogram” is an estimate of the second derivative, with additional gain and time constant from the signal filter. The “histogram” estimates the second derivative, because, as noted earlier, subtracting a filtered variable from the variable generates an estimate of its time derivative. The input to the signal filter is already the first derivative, so the “histogram” estimates the derivative of that, to get the second derivative. There is already enough filtering in place that it only takes the one additional “signal” filter to estimate the second derivative. The Wikipedia article on MACD provides a good visualization of the calculations for stock price analysis, with an example graph. In “technical stock analysis”, “velocity” means derivative, and “acceleration” means second derivative. The advantages are simplicity, minimal computation, and minimal data storage. 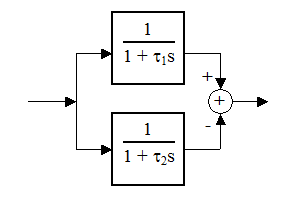 The two exponential filters are easy to implement and widely available in existing systems. Exponential filters have a minimal memory requirement for data - just the previous output, and the fastest calculation (assuming fixed time sampling size). The MACD approach takes much less computation than a full least squares filter, although the special case of the Savitzky-Golay filter is comparable for its simplicity and computational effort. The results are very smoothly changing outputs, heavily lagged so that there is no overshoot in the derivative estimate. One disadvantage is the extra lag compared to, say, a least squares filter. Also, some may be uncomfortable with the fact that this is an infinite impulse response (IIR) filter. As a result, following a step change, the sign of the derivative estimate will remain the same essentially forever as it decays towards zero. In the real world, the input will be changing constantly, so this is unlikely to be a problem. Exponential filters are IIR filters, but are heavily used in control systems.